My daughter’s room existed before she did. Whenever I treasure hunt at various thrift stores, garage sales, and antique stores, the things that I most adore are those that are pink and feminine: old perfume bottles with the pump, sequined clutches, once-white lace doilies, rose-tinted linens. The list goes on and on. For a while before my Maggie was here, I would pick those things up and think, “someday.” Soon, however, my patience wore thin, and I started buying those things I found simply irresistible. Before I knew it, the room next to my son’s was all ready for a little sister. My favorite piece was a fabulous old dresser, which I pulled from a pile of forgotten relics from my grandparent’s dairy, scraped ten layers of paint (ranging from green to gold) from, sanded, and re-painted the most wonderful shade of pink, adding glass knobs and some of the trinkets I purchased from a few of my favorite places. 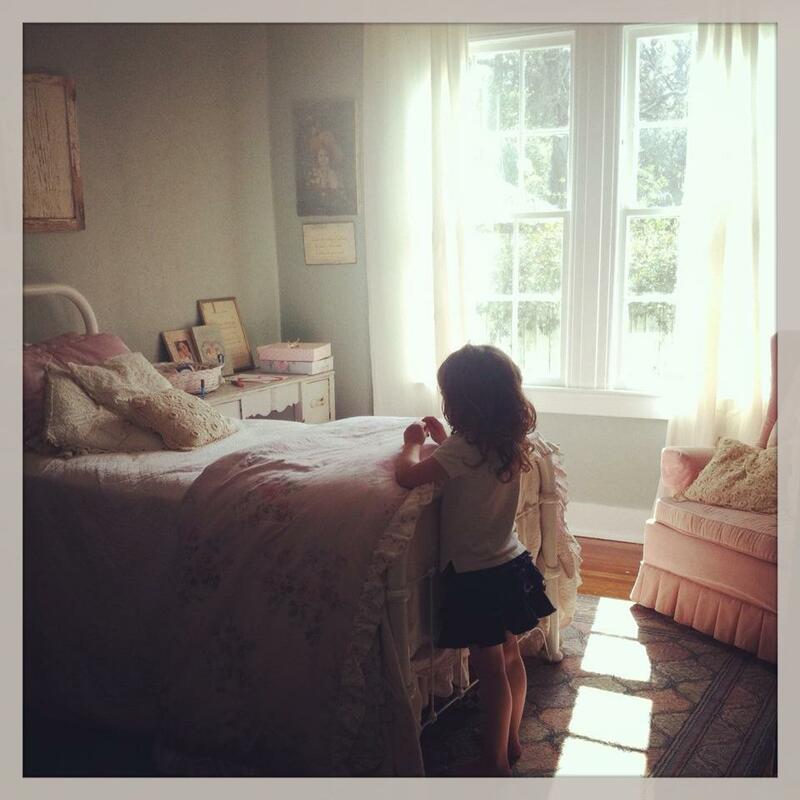 I would sometimes sit upon her iron bed, head resting on the lace-trimmed, pink satin pillowcases I got for a steal from eBay, and wonder if she would be like me and enjoy the space I created for her, using things that were around long before her grand- or even great-grandmother. The possibility of never having a little girl was not a thought I ever entertained. It was too important a dream to ever doubt. She made her arrival in March of 2005 and, by that time, we had moved from the house with her original room. Our new apartment in our new city only had two bedrooms, so I simply packed all of her treasures away, in anticipation of another dream to be realized–buying my first home, which I knew would be an older home, because I had planned it that way since I remember remembering. Since moving to my old house five years ago, Maggie’s room has undergone many transformations. She has been through three beds, three dressers, three chairs, four rugs, and several other small pieces and wall decor. Her wall color went from its original cream color to a country blue. I am, true to my indecisive nature, constantly finding new, more wonderful things to fill it with and it is more than I can stand to pout and admit there is no room. Instead, I find something to place in the attic and bring in the new, can’t-live-without treasure. Finally, I decided a twin bed fit the space better than a full and I purchased her head- and footboards from a local vendor for twenty-five dollars, since they lacked the rails to fit them together, which I (despite the vendors warning that I never would) found at a nearby flea market for ten bucks. A new paint job made it the perfect space for my little one to lay her head and dream. I decided on an old bench below the window, in place of a traditional side table, to house her many friends and books and whatnots. 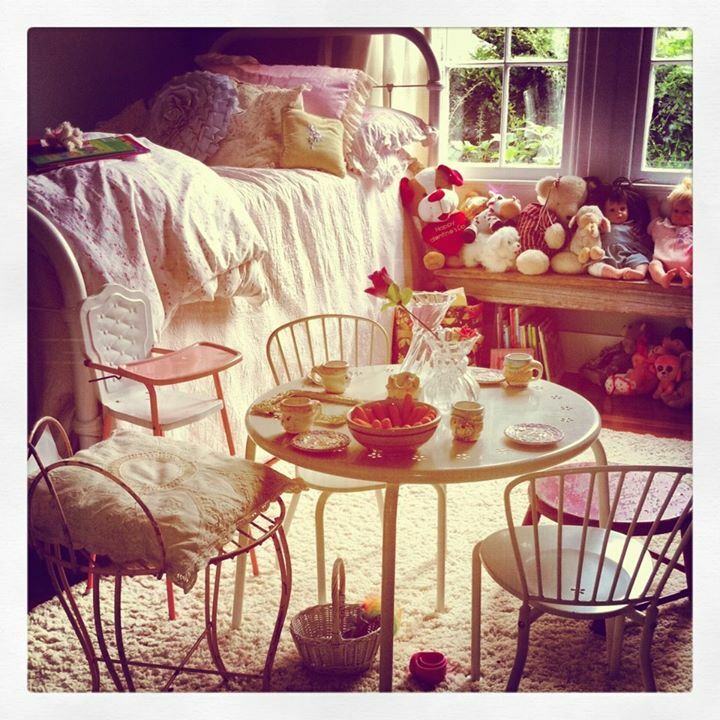 This particular arrangement lent itself quite well to tea parties. In the next phase, I decided to put the bed in the center of the room, creating a different kind of cozy. 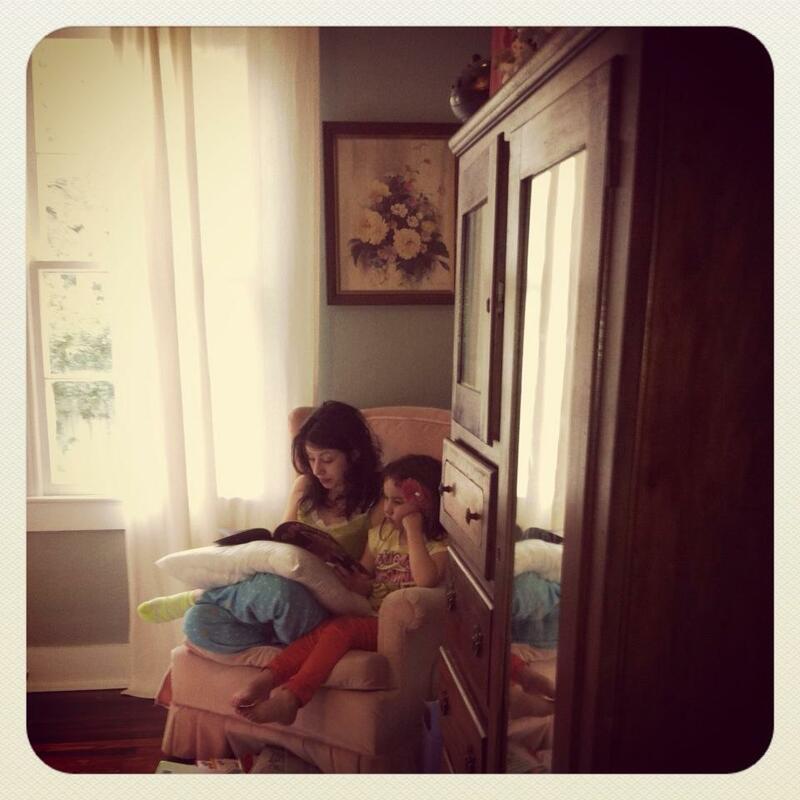 The cushy, pink, fifty dollar chair is perfect for one of our favorite pasttimes. The blue vanity beside her bed was one I eyed for quite some time. Some of the pieces I find are love at first sight. Others I need to think about for awhile, breeding either a “I can do live without you” or a “I can’t stop thinking about you and I must make you mine” relationship. Obviously, the blue vanity was the latter. For now, she uses it to create artwork as unique as herself and apply layer upon layer of glitter nail polish. In a few years, she will use it to apply makeup and figure algebra problems, though I am certain it will move to many other spots in the meantime. One of the many wonderful things about decorating a home with things hunted and gathered is that it lends itself well to change. There aren’t many expensive things between my walls. Much of it is interchangeable, even between rooms. I recently brought a bookshelf that dwelt in Maggie’s room for four years into my living room and put a new, more functioning chiffarobe in its place. The old bench that was once below her window now rests in front of my bed, after two weeks of dwelling in the long hallway which connects our bedrooms. It is all so temporary, but it somehow also embodies the feeling of being perfectly grounded. Much like my darling, dramatic daughter, who wonderfully surpasses all of my long-ago dreams, the parts may be ever-changing, but the whole remains the same, wrapping me in that feeling that can only come from being HOME.